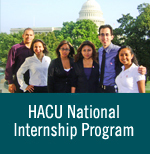 WASHINGTON, D.C – The Hispanic Association of Colleges and Universities (HACU) today urged Congress to add substantial new funding for Hispanic graduate and undergraduate education into a new bill introduced in the House of Representatives. Flores, in testimony today before the House Subcommittee on 21st Century Competitiveness, praised the introduction of H.R. 3039, the proposed “Expanding Opportunities in Higher Education Act of 2003,” as a sound starting point to more comprehensively address the education needs of the nation’s fastest-growing college-age population. However, Flores also urged committee members to insert new language into the bill to substantially increase federal funding for the nation’s more than 200 Hispanic-Serving Institutions (HSIs), which serve over half of all Hispanic higher education students. Title V of the Higher Education Act is Congress’ chief vehicle for targeting federal funds to HSIs, which continue to receive on average less than half the federal funding per student accorded other groups of degree-granting institutions. Flores testified that this inequity will be exacerbated by the sheer growth of HSIs, which are expected to increase by 50 percent within the next two decades because of rapidly increasing Hispanic student enrollments across the nation. HSIs are defined by a student enrollment that is at least 25 percent Hispanic. The “Expanding Opportunities” bill would authorize Congress to spend $94 million for federal Fiscal Year (FY) 2004 in Title V funds for undergraduate development at HSIs – a minimal increase over the current $93 million funding level. HACU proposed a $465 million Title V undergraduate funding authorization level for FY 2004 to allow HSIs to at least approach funding parity with other federally funded higher education institutions. HACU, which represents more than 300 colleges and universities with large Hispanic enrollments in 26 states and Puerto Rico, also proposed a first-time $125 Title V authorization funding level for graduate education development at HSIs. The “Expanding Opportunities” bill includes no funding for graduate education at HSIs. “Hispanics already make up one of every three workers joining the U.S. workforce today; by 2025, Hispanics will make up one of every two new workers joining the U.S. workforce. Clearly, Hispanics will have a profound impact on our country’s future economic success, security and global leadership,” Flores testified. “We must accord our largest ethnic population the opportunity to achieve the advanced skills and knowledge imperative to building a better future for our nation. Yet, less than 5 percent of Hispanics obtain a graduate or professional degree. This bill does not address this critical challenge that has such enormous implications for our future,” Flores said. HACU has joined the bipartisan leadership of more than 100 members of the Senate and House in urging support for earlier Senate and House versions of a “Next Generation Hispanic-Serving Institutions” bill that would create a graduate education component for HSIs and provide a $125 million funding authorization level for graduate education. Flores praised provisions within the “Expanding Opportunities” bill that would remove “onerous and unnecessary” regulatory burdens of current Title V language now impeding the efforts of HSIs to obtain Title V funds. The “Expanding Opportunities” bill would eliminate a two-year wait out period now required before HSIs with expiring Title V grants can apply for new Title V grants. The bill would also remove a 50 percent low-income assurance requirement now included in the definition of HSIs. However, Flores expressed concern over another component of the “Expanding Opportunities” bill that would for the first time allow “for-profit” education institutions to become eligible to receive funding as HSIs. “Because the existing community of non-profit HSIs already is so seriously under-funded, adding a new category of HSIs at this time would only further dilute the meager pool of federal funds now,” Flores said. “The Expanding Opportunities bill is an important start in recognizing the critical role Hispanics will play in our nation’s future economic, social and global success. However, we as a nation cannot hope to achieve that bright future without the commitment to make a substantial investment today in the higher education needs of our fastest-growing community of students,” Flores said.